Today there was an unexpected breakthrough in the generally shameful story of Australia passing its responsibility to asylum seekers on to its poorer, less developed neighbours. Papua New Guinea’s Supreme Court yesterday ruled that detaining asylum seekers who had tried to reach Australia on Manus Island was illegal, and today the PNG government said it would respect the ruling. Prime Minister O’Neill announced he would immediately ask Australia to find alternative arrangements for the asylum seekers sent to PNG. Currently about half of the 900 people detained on Manus Island have been deemed to have genuine refugee status, but have not been taken out of detainment and processed into regular life. Detainees live in squalid conditions and are not offered a genuine pathway to asylum, some locked up for year waiting in limbo. The moral standpoint from PNG is particularly poignant as the country has benefitted financially from the deal. Manus Island’s small businesses will suffer as a result and the government will make financial losses too if it has been paid by Australia to accept these people, as has been long suspected. 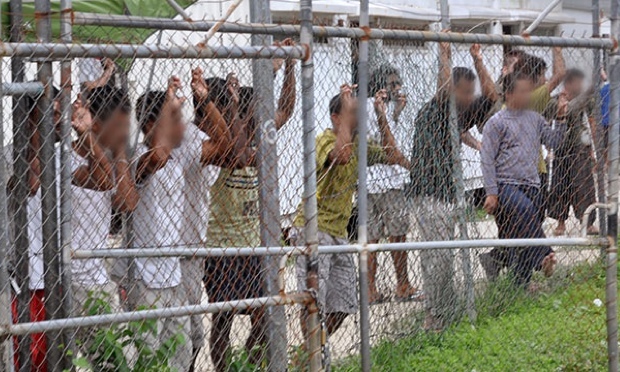 Prime Minister O’Neill said that when the agreement was made from PNG to take these people off Australia’s hands in 2013, it was intended to be a temporary solution to thwart people smuggling. But Australia has offered no further solution, shirking its international human rights obligations. Now PNG has thrown a spanner into the works of the Australian government’s offshore detention scheme right before an expected election campaign. In a statement, Immigration Minister Peter Dutton said the government would work with PNG to address the issues raised by the court ruling, but insisted that Manus Island detainees „will not be settled in Australia“. Meanwhile, O’Neill said the people already found to be genuine refugees would be offered a new life as residents on the island. Some had already made it clear this was not what they wanted. Local lawyers have said asylum seekers detained on Manus Island will have good grounds to take legal action both against PNG for their treatment in detention and Australia for passing off their responsibility to asylum seekers and sending them to their mistreatment. But where the people still without status will end up living or being held remains to be seen.